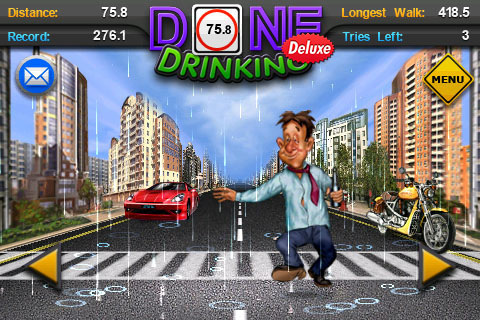 Done Drinking Deluxe is an iPhone game that tests your ability to help a drunk person walk a straight line. The game was created by JVL Corporation, costs $0.99, and is compatible with an iPhone, iPod Touch, and iPad. Drinking alcohol is universal, so I think it is safe to say that we have all, at one point in time been tipsy, wandering aimlessly off of our balance, and completely clueless as to where we are going and why. JVL Corporation takes that wobbly, disoriented feeling and deposits it into a game where you must walk a straight line using a drunken player. As the drunk sways to and fro you must tilt your device from side to side to straighten him/her/it out. You get to choose which drunk you want to use from a choice of Tipsy, Lola, and Clumsy. In addition, you get seven slots that you can customize with pictures of you and your friends. You take a picture of someone’s face or find one in your photo library and attach it to Tipsy, Lola, or Clumsy’s body. Tipsy is a man holding a beer who looks like he went to a bar after work and then never came out. Lola looks like she got drunk at an office holiday party off of island drinks, which is why she lost her pants. Clumsy is a monkey that looks like he likes to party. After you choose an intoxicated player, you choose the background that you want the player to stumble through. There are plenty of backgrounds to choose from for the player’s walk of shame including, Night, Office, City, Village, Town, Savannah, and Beach. It may not seem like much, trying to straighten out your player, but it is hard work. There is a certain finesse that goes into tilting your device from one side to another before your player falls to the ground. When you play using Lola, Tipsy runs to grab her before she can hit the ground. Done Drinking is hilarious. It is fun for a good amount of time before it gets boring, but the option to add your friends in saves it from getting dull too fast. AppSafari review of Done Drinking Deluxe was written by Vanessa Paszterko on December 21st, 2010 and categorized under Action, App Store, Fun, Games. Page viewed 4035 times, 1 so far today. Need help on using these apps? Please read the Help Page.